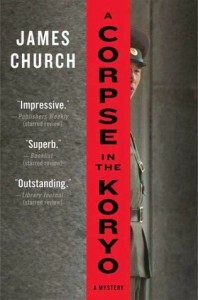 In the same vein of decent cops working for dictatorial regimes like my recently read Thirty-Three Teeth is James Church's A Corpse in the Koryo. Here, however, the atmosphere is far darker. Where Cotterill plays up the absurdities of the Pathet Lao's regime, Church's North Korean bureaucrats are vicious thugs and the slightest mistake could (and does) cost lives. Inspector O is the grandson of a respected general and war hero, which gives him a certain amount of freedom denied his peers but it's a freedom that gives him the "right" to forget to wear his lapel-pin photo of the Great Leader, and it's a connection that lets him exploit his grandfather's only in an unofficial capacity. "Church" is a pseudonym for a former intelligence agent, and his background gives a certain verisimilitude to the insane machinations the native police agencies and foreign governments engage in (ostensibly in service to the country or ideology but in reality to feather someone's nest or accumulate power against one's rivals). As usual with the better mystery novels, it's not so much the crime as the investigator who makes or breaks the story. In fact, it's hard to see what "crime" O is investigating. Sure, there's a "corpse in the Koryo" eventually but it doesn't signify in the end, where it's revealed that O and his department have been used as bait in a vicious power struggle between Deputy Director Kang of the Investigations Division and Captain Kim of Military Security. I like Inspector O. He's a fairly decent man, though sorely battered and cynically twisted by the horribly paranoid society he lives in. Which is the other strength of the novel: The depiction of North Korean society and how people learn to live within it. For anyone who liked Fatherland or Martin Cruz Smith's Arkady Renko, I'd strongly recommend this author; and I'd encourage any mystery/spy-genre fan to check Church out.